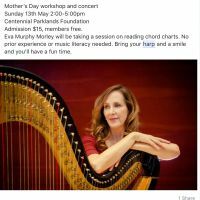 Additional Info: Harpist Eva Murphy has been for two consecutive years awarded the title of Most-Frequently -Hired Harpist in the nation, as well as Most-Frequrntly-Hired Wedding Musician of any kind in the country, on the most popular website in the world for booking live musicians (Gigmasters). Her hundreds of positive reviews posted by brides and by event planners are a testament to her ability to please all clients for all types of events. Degreed in Harp Performance (holding both a Bachelors and a Masters Degree), and having performed steadily for two decades on a nearly-daily basis in the finest hotels, restaurants and clubs in the world, her training and experience are unsurpassed. She is adept at all styles of music, playing classical, folk, popular and jazz. Wedding music is her specialty. Feel free to audition Eva in her oceanside home in Manly, NSW (at no obligation), or check out her several videos on YouTube.